The week-long Onam celebrations organized by the Tourism department of Kerala Government came to a wonderful conclusion with a colourful procession that travelled from the historical Kowdiar Square, adjacent to Kowdiar Palace, to the doorstep of holy abode of Lord Vishnu Sree Padmanabha Swamy Temple at East Fort. The entire stretch of about 10 kilometres was dotted with people from all walks of life. The general public came in colourful costumes at different places along the assigned route of procession very early and took their positions in anticipation of the visual treat. The procession marking the end of the week-long celebrations was flagged off by Kerala State Governor His Excellency P. Sadasivam in the presence of Union Minister Nitin Gadkari. There were 90 floats in this cultural pageantry. A total of 5000 artistes came together to present 160 art forms in this procession. Each of the 90 floats depicted different aspects of Kerala. One watching the colourful procession would have noticed and appreciated the change in rhythm and music after every 10 steps as each float had its own theme music and visual masterpiece. In this year, the makers of different floats took pains to drive home one message or the other. Hence, the add-on values for these visual treats were much higher when compared to those drawn out in the previous years.
.	Malappuram District Float: Titled 'Esal Peruma and Thalaperukkam, the district's float was a brave attempt to translate the abstract ideas in modern poetry into the logical visuals that relate to modern-day life. Many of the spectators would have liked the minimalist aesthetics of this float for its simplicity in presentation. 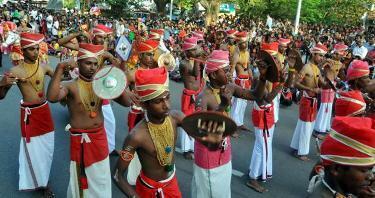 For instance, the artists performed the Kolkali and Oppana to the tune of Mappilapattu. Float on Civic Issues: This float tried to discuss the current issue plaguing the cities of Kerala. It showed a giant heap of garbage bags and a stray dog gracing through it. It also showed the stray dog issue by freezing a grab in the form of a visual involving a stray dog staring at a school kid. The befitting narration of these visuals was given by an Ottamthullal artist. He sang how the mentality of general public and indifferent administration has precipitated this crisis in the state. Wayanad District Float: its float showcased the one of the ages old and dying art from that used to be performed by the members of Paniyar tribe. The name of the art form is Kambalanatti. Kollam District Float: On this float, the members of Karunagapalli Nattarangu Sangham performed another art form Mudiyattom. Float from Department of Public Instructions: Its float was dedicated to the memory of late Abdul Kalam who was the people's President. On its LED video wall, a speech delivered by the former President came alive to the amusement of youngsters in the crowd. The float also displayed various messages given by Dr APJ Abdul Kalam. 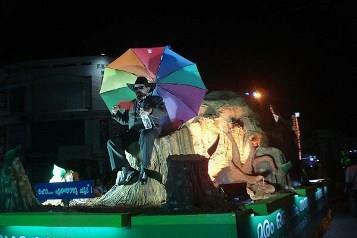 Float from Kerala State Excise Department: Its float depicted the after effects of drinking arrack and toddy. It showed a scene from a family of a drunkard. It also symbolized in the form of an infographics the plight of a drunkard's family stuck inside a bottle. Float from Department of Health and Medical Education: This float showed the importance of organ donation. This assumes significance as the state has seen a sudden spurt in organ donation involving the brain dead and terminally ill patients. Float on Tribes: A group of Gujarati people dressed up like African tribes and performed a tribal dance to amuse the audience on this float. Through their dance, they claimed that they were from African jungles. Others: There was another float that showcased the cartoon characters like Chotta Bheem and Hello Kitti. This float had balloons depicting these cartoon characters on colourful balloons. The colourful week-long celebrations on the eve of Onam festival in the state of Kerala came to an official conclusion with a colourful procession. Over 90 floats took part in the pageantry that travelled a distance of 10 kilometres from Kowdiar Square to East Fort. The procession bringing the curtain down on the festivities was flagged off by the Governor of Kerala State His Excellency P. Sadasivam in the presence of Union Minister Nitin Gadkari. 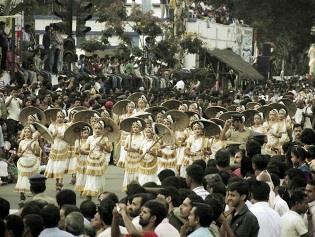 The procession showcased over 160 art forms of Kerala and about 5000 professional artists participated in it. The organizers of the procession at the culmination of the week-long celebrations have made sure that all the floats carried a message or two for the audience. The procession took over two and a half hours to cover the distance through the pre-scheduled route. A large number of people from different walks of life were in attendance all along the route. They came in colourful attires hours before the official commencement of the procession. Hence, the main streets of the capital city were behoved with activity late in the evening of August 31, 2015.